Real Photo Postcard. Nice view of an automobile with a sign "Capt. Lindbergh's First Gear Shift Auto Motive Machine". 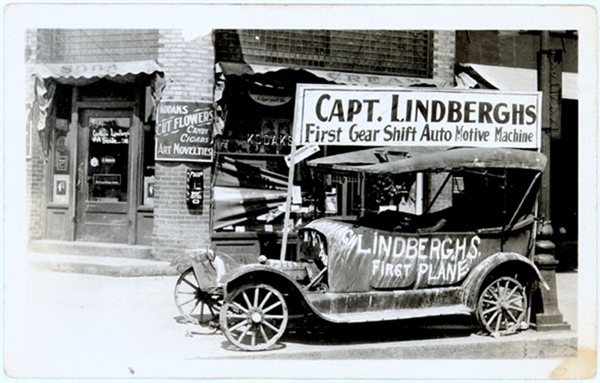 Painted on the side of the car is "Lindbergh's First Plane". Very light discoloration at lower right corner not affecting the photo. Unused. Clean back. In 1916, Evangeline and Charles drove to California to visit Lillian, who had been diagnosed with tuberculosis. Evangeline did not have a good relationship with either of her stepchildren, but she took the trip to help make amends. In October they set off in the family's new Saxon Six automobile. Joining them was Uncle Charles from Detroit and the family dog, Wahgoosh. With the Saxon reaching a top speed of just 25 miles per hour, it took 40 days to reach their destination. It also did not provide adequate protection in bad weather and could not handle rough road conditions. Evangeline and Charles spent the winter of 1916-17 in southern California. In 1927, after Charles' famous flight, souvenir hunters stripped the car and took it through town for Lindbergh’s homecoming parade with “Lindbergh’s First Plane” painted on the side. In the late 1960s a maintenance battalion from Camp Ripley restored the Saxon to running condition. The car is currently on display in the Minnesota museum.